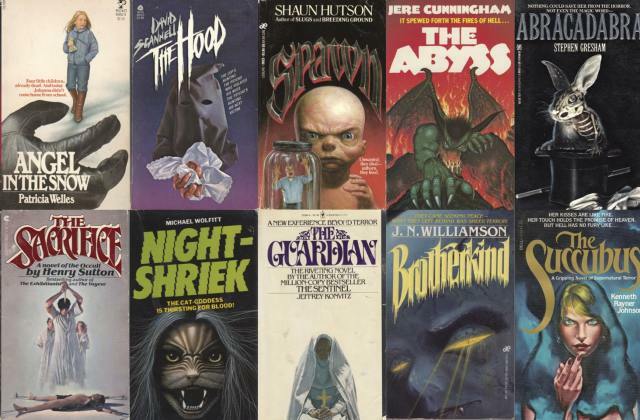 Jill Bauman – if you’ve seen a doll on a horror paperback cover, it was probably painted by Jill Bauman. A longtime fan favorite, she has illustrated covers for everyone from Harlan Ellison, to Ramsey Campbell, to Dean Koontz, Stephen King, and Peter Straub. Lisa Falkenstern – award-winning artist, Lisa Falkenstern, has painted some of the most memorable horror covers in the business, and she was the regular VC Andrews cover artist for 15 years. Thomas Hallman – still painting book covers today, Tom Hallman’s distinctive style has graced everything from forgotten creature horror novels like Gila! to popular paperbacks like Stephen King’s The Green Mile.